If either one of the joint-account holder dies, who gets the money? Let’s say you have a joint account with your spouse in a local bank. Due to an unforeseen accident, your spouse passed away (touch wood). Are you entitled to withdraw all the money in the account, say RM100k? The answer is not simply a “yes” or “no”. It actually depends on the bank’s rules and regulations. What I learn is that there are three possibilities. 1. You cannot withdraw any money. 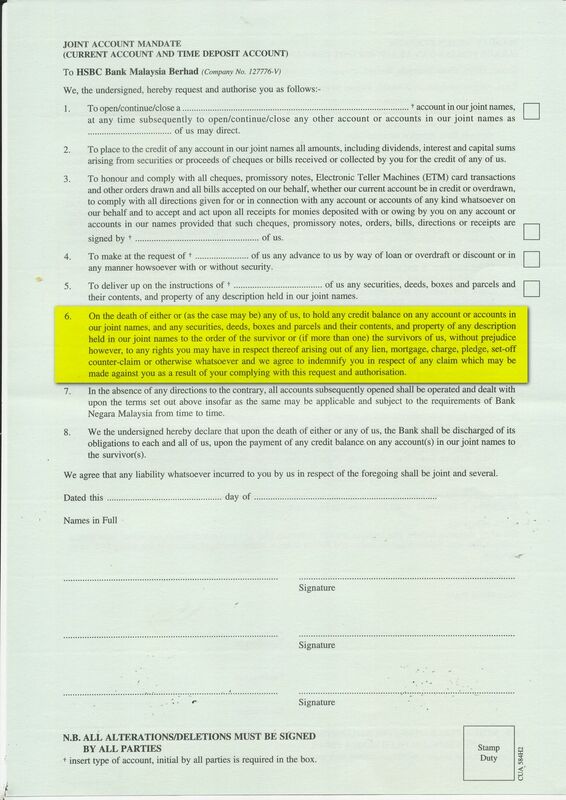 When the bank knows about a person’s death, the respective account shall be frozen until court order is obtained. If the account is frozen, you can’t withdraw any money. 2. You can only withdraw 50%. It might be legal to withdraw only 50% of the amount in the account because you own half of it. But this can only be done if the account is not yet frozen. Different banks might have different guidelines. If you are working in the bank, please enlighten us about the banks’ practice. 3. You can withdraw 100%. Let’s assume that the bank don’t know that your spouse has passed away. You withdraw all the money as usual and nobody notice anything. This might be illegal because when a person is dead, his/her asset should be frozen until court order is obtained. If it is not mistaken, it means that when any of the joint-holder dies, the survivor shall legally own all the money in the account. I am not a lawyer. Please correct me if I am wrong. 11 replies to "If either one of the joint-account holder dies, who gets the money?" They say it’s a new BNM policy. Have you heard anything of this? I am not sure if it is a new BNM policy. What you can do is to check with different banks. My personal family experience is that we are still able to withdraw with just one party presence. there is a joint account on self /or mandate. on death of one account holder the surviving accountholder will be entitled to operate account. what if a certain bank does not oblige.